Mothers Day is swiftly approaching and today, I’m gathering with my good blogging friends to bring you a list of recipes that would be perfect to celebrate your mama. Our host is once again the fabulous, hard working Jen of Jen’s Favorite Cookies – thank you so much for putting all of this together! The brioche dough after 48 hours in the fridge. I don’t call her every day, or ever, really. We don’t hug or say “I love you.” She’s never told me she’s proud of me or complimented me on anything. I don’t know what any of my mom’s “favourites” are because she has never expressed a preference for anything. I don’t know what her birthday is because we celebrate the lunar calendar, which changes every year. I don’t know what dress size she wears. I don’t know her back story – who her friends were growing up, how she met my father, what their wedding was like, etc. My parents are the stereotypical Chinese parents. Stern. Firm. Traditional. They don’t believe in having friends because family comes first and foremost. They show love not through hugs but through working hard to put a roof over our heads, clothes on our backs and food in our bellies. They don’t compliment and tell us we’re special. Instead, they aggressively push us to be our best so that we won’t suffer in life. The lessons they taught weren’t to reach for the stars but to have an education so that we wouldn’t have to do manual labour. Save your money so that you won’t be poor. They didn’t come to parent-teacher nights or school concerts or hold parties for us on our birthdays. They were too busy working. This all sounds harsh but it’s my life and it’s my reality. This is what I know, it’s all I know. And I appreciate my parents so much but especially my mom for everything she’s given and taught me. Her marriage to my dad was arranged. They never had romance or true love. Instead, there was a lot of fighting but in their old age, they’ve settled into a comfortable routine. Because of all that, my mom taught me to never rely on a man. Always have my own bank account. Be self-reliant and independent. Be smart. Be strong. My mother has never complained a day in her life. She is the hardest working person I’ve ever known. She grew up in China during the Cultural Revolution which was brutal, to say the least. She gave birth to my older sisters in China and almost immediately after labour, went back into the field to keep farming. She moved to Canada, not knowing a word of English, leaving behind her entire family, and went straight to work in a sewing factory where she stayed until retirement. The entire time I lived in her home, she would get up at 5 a.m. to cook breakfast and lunch for me, my three sisters, my dad and my grandparents. She’d come home after work and cook dinner (everything fresh, never processed) and then clean the house. She’d carry home twenty pounds of groceries on public transit every week without ever asking for help. My mom is not only the best mom, she’s also the best grandma. She loves my nephews and niece so much, always going out of her way to do whatever she can to help them and my sisters. My mom has never owned anything nice. No nice clothes, jewelry, furniture, etc. Everything my parents own is super old but as long as it functions, that’s good enough for them. My mom doesn’t go to the salon or the spa. She doesn’t get her hair done. She’s never worn make-up in her life. She doesn’t take care of herself because she’s so busy taking care of us. In all these ways and so much more, that is how my mom shows her love. She demonstrates through her actions and her awe-inspiring selflessness how much she loves us, how much she cares for us, and how important we are to her. Me ‘n my beautiful mom. I love my mom more than words can say. Any intelligence or strength I have within me comes from her. In honour of my mom and all the mothers out there, I made no-knead brioche filled with Caramilk squares. Yes, I took the easy, lazy way out but hey, work smarter not harder, right? My mom taught me well. Before we get to this magical recipe, listen to the Spice Girls sing about their relationships with their moms and make sure you visit everyone else’s blog to drool over their delicious recipes! Whisk flour, yeast, and salt together in large bowl. 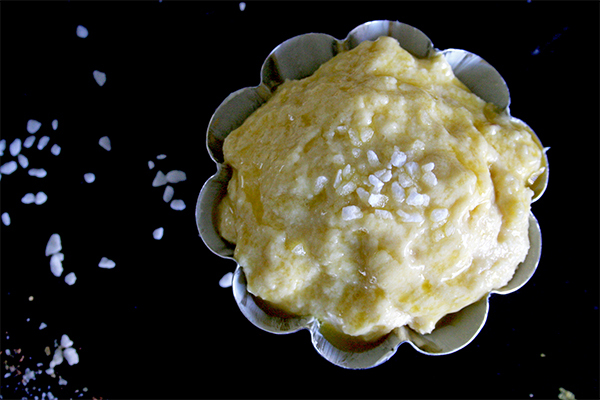 Whisk the 6 eggs, water, and honey together in medium bowl. Whisk in the butter until smooth. Add the liquids to the flour mixture and stir with a wooden spoon until fully combined and no dry flour remains, about 1 minute. Cover the bowl with plastic wrap and let it sit at room temperature for two hours, then refrigerate for at least 16 hours up to 48 hours. Remove from the fridge and at this point, you can either shape them into two loaves or into buns. The dough is quite wet and sticky so if making loaves, I’d recommend simply dividing the dough in half and placing each half into a well buttered loaf tin. Let the dough rest for 60-90 minutes. In the last half hour of resting, preheat the oven to 350 degrees F. Brush the tops with egg wash and bake approximately 30-40 minutes until the tops are a deep golden brown. 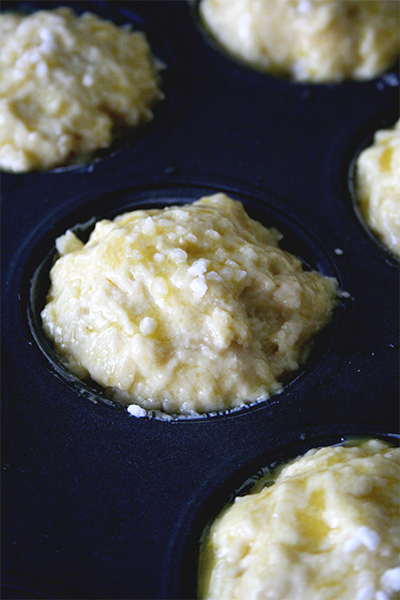 Butter a muffin tin or brioche tins. 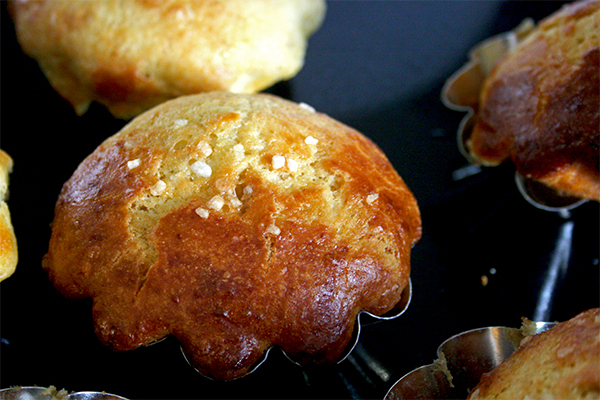 I was able to fill 6 brioche tins and 8 muffin tins with this recipe. 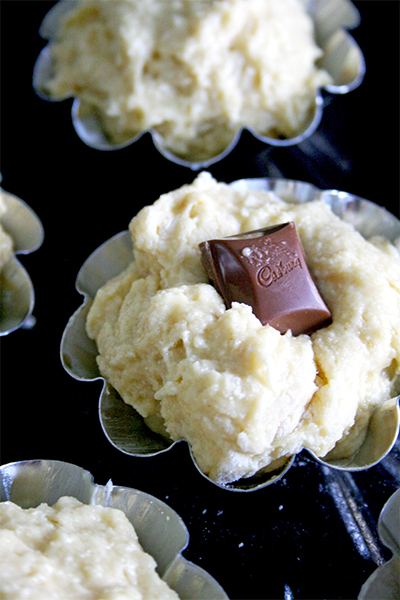 Scoop out approximately 4 tablespoons of dough with your hand and press 2 Caramilk squares into the centre. Gather the dough around the Caramilk squares and press together so that the squares are completely covered. Place into the muffin/brioche tins, seam side down. Continue until you’ve used all the dough. Let the dough rest for 60-90 minutes at this point. In the last half hour of resting, preheat the oven to 350 degrees F. Before placing the dough into the oven, lightly beat one egg with a pinch of salt. Brush the beaten egg over top of the brioche. You can sprinkle pearl sugar or any other large-crystal sugar over top but this is completely option. Place into the oven and bake for 15-20 minutes, until the tops are a deep golden brown. Remove from the oven and allow to cool before eating. I can’t believe how amazing no-knead brioche tastes! Almost as good as brioche made the old fashioned way. The outside was super crispy and the inside was buttery, light and airy. 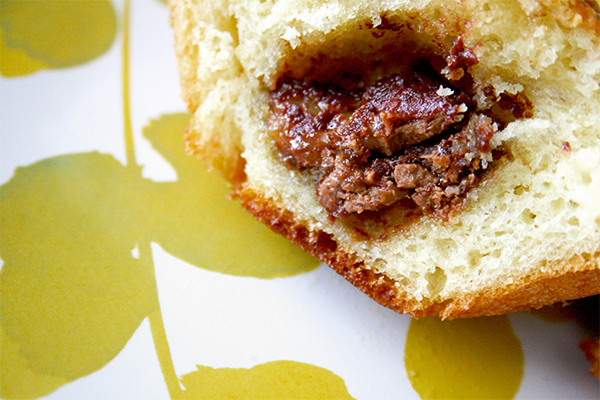 The molten chocolate-caramel center worked perfectly with the light flavourful bread. This couldn’t have been easier to make. Simply mix together the dough and let it sit in the fridge. 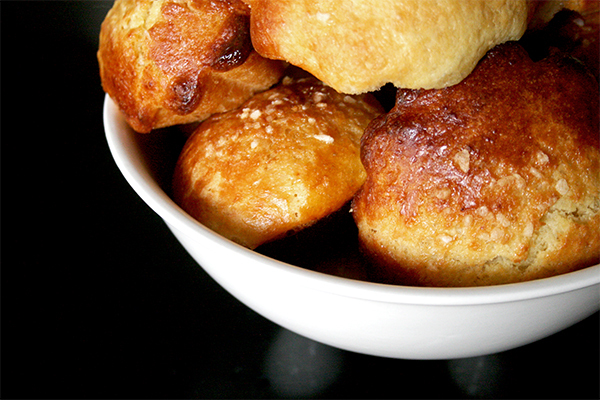 Even if you have a yeast-phobia, you’ll be able to conquer this recipe like a boss! To all the mothers out there, thank you so much for everything you do. You deserve to be pampered by your kids and loved ones. Just leave a list of these recipes lying around and hopefully someone will make it all for you! Nancy, I remember you writing about your mother before. . what a beautiful and honest post. As a daughter to Asian parents myself, I can relate to what you went through growing up. . you mom is amazing and I love that you said “Any intelligence or strength I have within me comes from her.” so beautiful!! And you look just like your mom! That photo above, that’s YOU holding a baby. Do people tell you you look like her? anyway, what a beautiful post and recipe. . As my parents grew older and especially after becoming grandparents, they softened up tremendously. . they started saying I love you to us more and were showing crazy affection to their grand children. . I hope for you, this Mother’s Day, that you are able to show your mother your appreciation, maybe not by words but by showing how much you love her. love you lady! Thanks for such a beautiful post! What a beautiful tribute to your mom, Nancy! What an inspiration. And I love the photo of you two…and, of course, your amazing chocolate filled brioche. Wow!!!! What a beautiful post!! I love your honesty (in all your posts!) and picture of the reality. Your mom is so beautiful and it’s so cool that you two look alike. Or maybe I’m just seeing things? As an African kid, I can relate to almost everything you said here. I am not that close to my mother, we don’t call and talk on phone every day, no hugs and I love yous and being as strict as she is. But I do know she loves me and gave up lots of things (and worked so hard) to put a roof over our heads, give me opportunities that she never had and make sure we succeed. Mothers are incredible and deserve to be celebrated everyday. I wish we tell them how much we appreciate what they do for us. I hope this Mother’s Day, we can at least let them know by action in our case here how much they mean to us. Of course this stuffed brioche is amazing!! You don’t cease to amaze me dear!! What a lovely and heartfelt tribute to your mom. Your love for her shines and your appreciation for all she does is clearly evident. It’s those every day not special things our moms do that means so much and becomes the most special of all. I love this post, Nancy. So heartfelt and genuine, which is what I love about you. The bread looks fantastic, too! great post, I LOVE your parents and their stern ways. I could go on all day how if more parents were stern what state the youth would be in today instead of the entitlement they feel. Refreshing to read. This bread looks fabulous with a great crust, wish we were neighbors! Thank you for sharing the story of your mom. Her sensibilities are different than a typical American mom today but I understand where they came from and the devotion she had to her family. She may not have given you parties but she gave you a lot. As for these rolls, I seriously don’t know how you had the willpower to photograph them and not just stuff them in your mouth, which is what I want to do! I wish my Mother were still here. She would have loved this recipe as much as I do. I never knew you could make a no knead brioche. Thanks for sharing! Chocolate in anything is a huge win! What a beautiful tribute to your mom! Our moms all raise us and take care of us and teach us in different ways, and while your mom doesn’t fit the traditional North American “ideal”, I think it is incredible that you recognize what she has given to you in her own way. What’s crazy is that I can get so absorbed into your writing–Michelle from Hummingbird High has a similar talent for this, but your writing voice–just wow. I can’t exactly empathize with your situation (my mom and I talk really frequently, and half the people we meet actually think we’re sisters! ), but I found the story really moving. Kind of an awesome reminder of everything we can be grateful for, especially with parents who gave up everything and moved to a strange new country for us. I can’t imagine doing that on my own as is, much less without a penny and with a family to support. And it’s always nice to know that the silent support is always there, regardless–as I’m sure it is with this wonderful recipe. Okay, off to pack up my suitcase now 🙂 hope the weather is AMAZING! Or I’ll bring some southern sunshine……..
Nancy, this was a beautiful post. Every time I read about the previous generation and how hard many of them had to (and continue to) work to provide for themselves and their families I feel both incredibly blessed and incredibly lazy. Honestly, I don’t know how they did it. It really is awe-inspiring and a huge act of love. I work at a desk for 40 hours a week and still complain about how busy or how tired I am. <<<<Lame. This was such a great reminder to me of how easy I have it! Hi Nancy. Loving the new look blog and your delicious little treats for mother’s day. I think that those little surprise pillows of chocolate would make any mother happy. Love the vintage photo set too. Adorable! Nancy, are you going to hate me if I bring up the Tiger mom? I’m not Asian so I was raised very differently, but that book made me think loooong and hard. This post reminded me of it. About being a parent and not a buddy or a pal. Thank you for sharing about the unique love that you share with your mother. I wish more people could have such strong (if not flashy) relationships with their parents. I think the world would be a happier place. This is such a beautiful and inspiring post, Nancy. Your mom sounds like such a hard-working woman. I’m sure she would appreciate these delicious rolls. I love that they’re oozing chocolate and caramel. What a beautiful tribute to your mom Nancy! She sounds like she’s an incredible woman and is an amazing mother, just in a different way! You can’t get through life on hugs alone, so instead she just gave you the truth and I guess it’s easier to appreciate that as an adult. So now on to these bad boys. 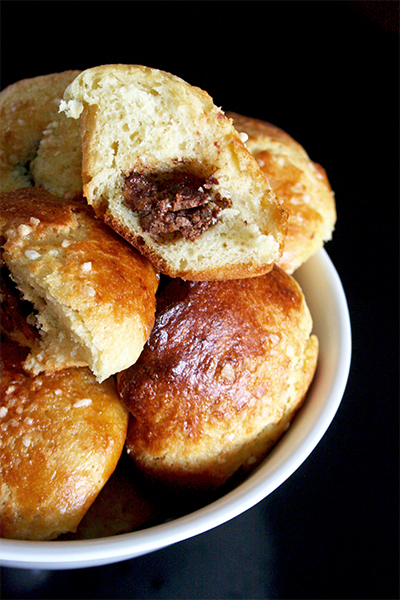 I’m all over some no knead brioche, especially if it’s stuffed with some chocolate. I’m going to to have to get working on that stat! Beautiful tribute…beautiful brioche…just a lovely post from start to finish. Makes me want to do something super special for my mama this year. Thank you for sharing it with us today. Made my night! Oh my gosh Nancy! This post really touched my heart. I’m a bit teary! I know from so many of my Chinese, Taiwanese, and Korean friends that their parents were also stern, and pushed them really hard. But I never really understood about how that came from such a loving place, until reading your words here. This is such a beautiful tribute to your mom! God bless her, she sounds like such an incredible person. Also, I can relate to a lot to your relationship with your mom. 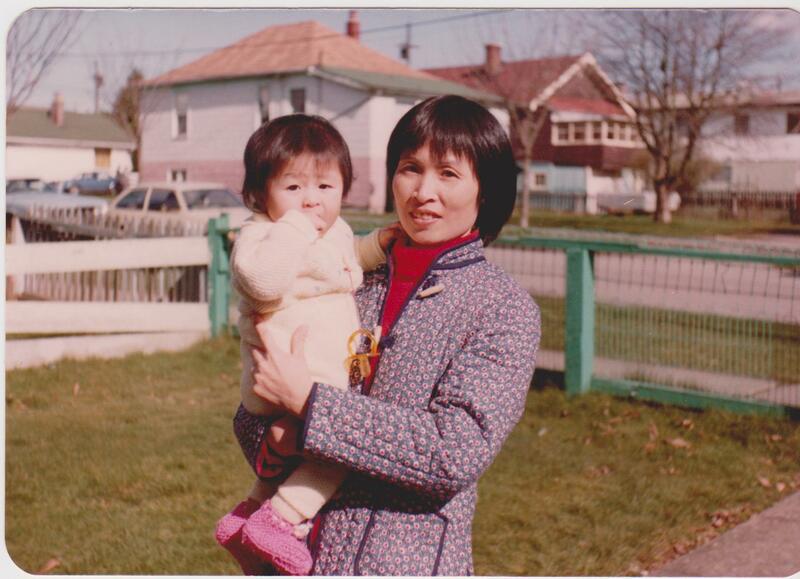 I’m the first-generation daughter of an immigrant mom too, and even though our background isn’t Asian at all, she could “Tiger Mom” with the best of them. It made for a tough road when I was younger and wanted my mom to be less strict and more indulgent like all my friends’ moms, but now that I’m older, I understand that she pushed me like that because she wanted the best and didn’t know how to express it any other way. Your love for your mom totally shines through here, though, and it’s obvious that she’s a very amazing lady. Thanks for sharing your story! and this brioche is bomb, just sayin’. Cuz…yeah. YUM. First of all Nancy, the brioche looks amazing and delicious. Second of all, what an well written and honest post. I was a little stunned reading it all because it’s so different than what I know, but at the same time, you are who you are because of your upbringing…, as we all are. Sounds like your mom taught you some very valuable life lessons. And omg you look just LIKE HER!!! Amazing! Sweet, heartfelt, honest post . Love it. Such a sweet tribute to your mom Nancy and I’m sure she’s really proud to see what you’ve accomplished in your life! Your Brioche looks every bit delicious and absolutely amazing!!! I love Brioche and as you know just made it for the first time 🙂 I can now try baking bread, something I never did before 🙂 Thanks for a lovely recipe dear friend. Loved this post, Nancy. It’s a beautiful tribute to how you grew up and all the hard work your mom has put into raising you. I hope she gets to read this post. And that photo of you and her? She is the spitting image of you! Or, I guess that means now, you are the spitting image of her. Pretty ladies!